Dave at Slinkylinks has literally been scouring the world for a better termination for their speaker cables - we’ve been convinced by the improvement made by the Eichmann silver bullets on the interconnects but the cost of the Eichmann bayonets on speakers cables is proportionally much more, especially in bi-wire connections so an alternative had to be found. While we still think the silver bayonet plug is the ultimate in terms of performance, the new 4mm instrument plug now used by Slinkylinks is very very close - it may not look like much but a high purity copper substrate, overlayen by gold and then coated with a thick layer of ultra pure silver makes for exceptional sound quality. I’ve been taken aback by how obvious the difference is between this new connector and the standard gold plated plugs. And it has given us good cause to take a fresh look at SlinkyLinks. Let’s just quickly go back to the key differences between SlinklyLinks and most other cables. Silver is better than Copper. It just sounds better because it is a better conductor of electricity - and in any audio system that has got to help. The fact that silver is far slower to oxidize than copper and also that silver oxide is conductive (copper oxide isn’t) is a further advantage. Pure metals are better than impure metals - and the silver SlinkyLinks use is very, very pure. Other cable companies also use silver for their best cables. Just about every other cable company has started with copper cables. And funnily enough, most share the same construction techniques dressed up with flash packaging, literature and hype. But they are all still copper. Even worse, these companies have jumped on silver, but then employ the same construction for these cables. With the same problems. 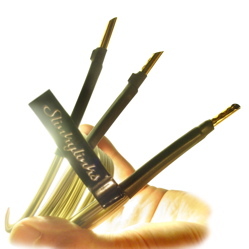 Lots of shielding (SlinkyLinks don’t have any - but get this - there is no interference problem - SlinkyLinks cables are very quiet), Big macho plugs like a fake Rolex don’t make cables sound better, and only impress the uninformed. One of the key components of the sound of SlinkyLinks interconnects are the Eichmann Bullet plugs. Their design approach is very much the same as SlinkyLinks - overturning old thinking and going back to basic principles. With SlinkyLinks, great care goes into the selection of terminating plugs and the connection of these to the cables. Wherever possible the pure silver pathway is maintained and the obvious difference this makes to sound quality proves well worth the small extra cost. Each of these 4 factors makes a considerable difference - combine them all and you have an unassailable advantage over other designs, especially when you also factor in New Zealand manufacture. 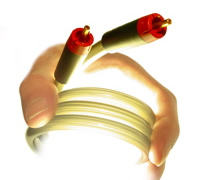 We are adament that there is no finer sounding cable in New Zealand at at anything like the price. And in fact in an overseas context it becomes obvious that SlinkyLinks are world class cables and seriously competitive. As components get better, the differences cables make become even more obvious and the benefits and cost effectiveness of the SlinkyLinks equation become even more compelling. We run Slinkylinks at home and in just about every system in the shop. Virtually all of our serious clients have multiple sets. Isn’t it time you joined us?